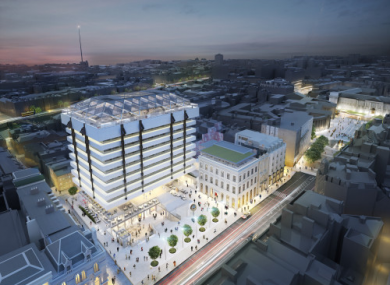 AMBITIOUS NEW €75 million redevelopment plans for the iconic Central Bank building that includes a new 360-degree 300-seater rooftop restaurant and bar have been given the green light. This follows An Bord Pleanála dismissing the appeal by one Temple Bar resident against Dublin City Council granting planning permission to the development on Dublin’s Dame Street. The redevelopment will host over 1,000 office workers in 12,000sq m of offices as well as shops in the adjoining buildings. However, Vincent Howard was one person not happy with the unrivalled views from the roof terrace and complained that if the redevelopment went ahead “any privacy I currently enjoy is gone”. He said: “I have spent a lot of time and money to make this garden a nice place to be and we use it regularly throughout the year and daily in the summer – entertaining, sunbathing, eating meals or just sitting outdoors. “While some level of overlooking (of Mr Howard’s garden) will inevitably occur, I consider that the impact on one private individual’s visual amenity must be balanced against the wider benefits economically, culturally and in urban design terms which the proposed development will bring to the city centre. “Furthermore, the viewing platform will be located 67 metres from the appellant’s roof garden which is a significant separation distance particularly having regard to the site’s location within the city centre. Consultants Hines and Peterson told the city council that “the vision for this redevelopment is to create a world class mixed use scheme incorporating food and beverage and retail uses at street and basement level, the sensitive refurbishment of the existing office floors and the creation of a two storey roof top destination”. Email “€75 million new Central Bank plan gets green light despite resident's objection”. Feedback on “€75 million new Central Bank plan gets green light despite resident's objection”.